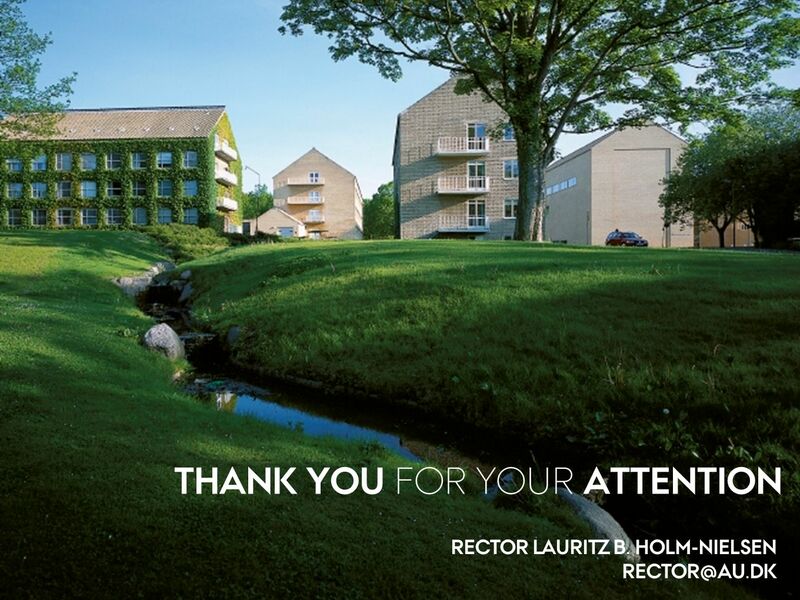 29 AUGUST 2011 AARHUS UNIVERSITY - A BRIEF PRESENTATION 29 AUGUST 2011. 3 Rector Lauritz B. Holm-Nielsen29/08/2011 AARHUS UNIVERSITY A UNIVERSITY IN GROWTH Merger between Aarhus School of Engineering (IHA) and Aarhus University Government approval of merger – effective 1 January 2012. 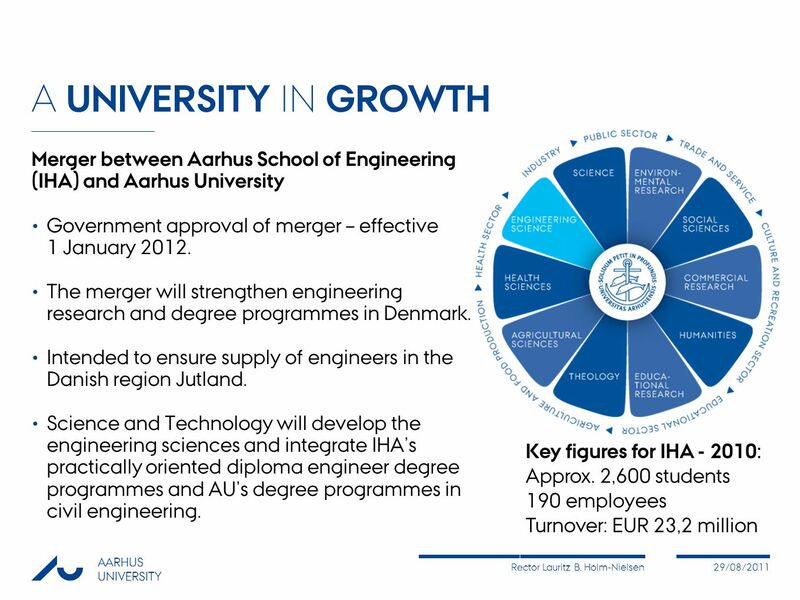 The merger will strengthen engineering research and degree programmes in Denmark. Intended to ensure supply of engineers in the Danish region Jutland. Science and Technology will develop the engineering sciences and integrate IHA's practically oriented diploma engineer degree programmes and AU's degree programmes in civil engineering. 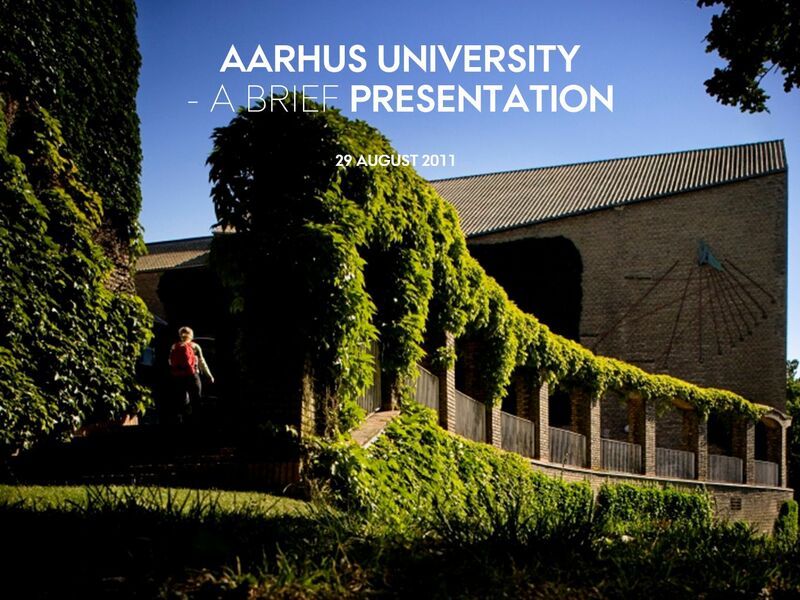 Download ppt "29 AUGUST 2011 AARHUS UNIVERSITY - A BRIEF PRESENTATION 29 AUGUST 2011." This is Vision TAMK offers keys to success by creating new and international expertise. Mission With its multidisciplinary approach and strong orientation. Mergers – a response to global challenges. A A R H U S U N I V E R S I T E T AARHUS UNIVERSITY IMHE-NUS conference Reykjavik Rector Lauritz B.
TATIONpRÆSEN AARHUS UNIVERSITET 1 AARHUS UNIVERSITET Aarhus University - The new administration. Lauritz B. Holm-Nielsen, Rektor A A R H U S U N I V E R S I T E T Globalisering og de Videregående Uddannelser Rotary Århus 22. november 2005. 24 MAY2011 SENIOR MANAGEMENT SEMINAR SANDBJERG ESTATE, MAY AARHUS UNIVERSITY. 6. May 2011 Welcome to the new Aarhus University and NOVA Annual Seminar 2011 JØRGEN B. JESPERSEN AARHUS UNIVERSITET. RECTOR LAURITZ B. HOLM-NIELSEN AARHUS UNIVERSITY RECTOR LAURITZ B. HOLM-NIELSEN GOVERNANCE AND INSTITUTIONAL AUTONOMY OF UNIVERSITIES COMPARISON. A modern, international university in Småland, southern Sweden. 9 MARCH2011 The Aarhus University of the Future STAFF MEETING, 9 MARCH 2011 AARHUS UNIVERSITY. NATIONAL RESEARCH UNIVERSITY “HIGHER SCHOOL OF ECONOMICS” GLOBAL COMPETITIVENESS PROGRAM ROADMAP TO WORLD-CLASS UNIVERSITY Yaroslav Kouzminov, Rector October. February, 2011 AARHUS UNIVERSITY Rector Lauritz B. Holm-Nielsen AARHUS UNIVERSITY Research and Higher Education in Denmark Rector Lauritz B. Holm-Nielsen. Learning and Creativity in a New Environment Anna Valtonen Innovation in Learning Communities EDEN 2009 Annual Conference. Czestochowa University of Technology ( ). 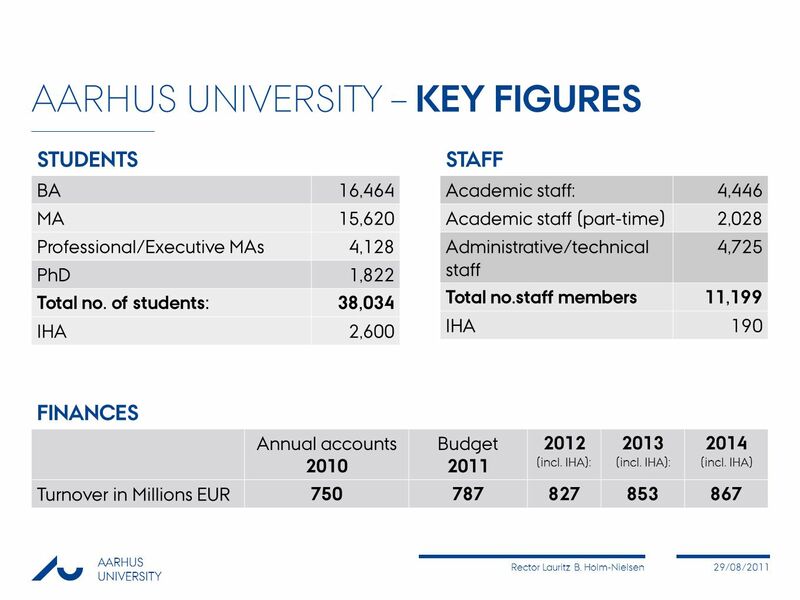 2012 AARHUS UNIVERSITY Welcome to Aarhus University. THE CASE OF AARHUS UNIVERSITY EMPOWER EUROPEAN UNIVERSITIES, MAASTRICHT 2011 RECTOR LAURITZ B. HOLM-NIELSEN HOW DOES THE EMPOWER EUROPEAN UNIVERSITIES. 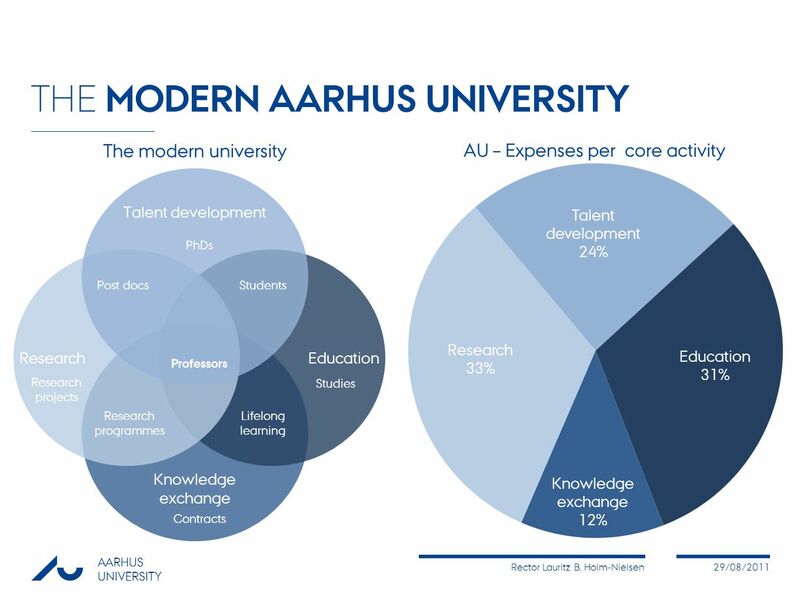 TATIONpRÆSEN February 2011 AARHUS UNIVERSITY DANISH UNIVERSITY FUNDING MODEL AARHUS UNIVERSITY – AN EXAMPLE AARHUS UNIVERSITY Au. 15. JUNI 2011 RECTOR LAURITZ B. HOLM-NIELSEN, AARHUS UNIVERSITY BUILDING STRONGER UNIVERSITIES IN DEVELOPING COUNTRIES. 15 DECEMBER 2011 RECTOR HOLM-NIELSEN'S CHRISTMAS SPEECH THE MAIN HALL - 15 DECEMBER 2011. AARHUS UNIVERSITY 4 August 2010 14/19/2010October 21, 20159 April 2010X AARHUS UNIVERSITY.